Interior designed by Debbie Heal,&nbsp;La-Z-Boy’s buyer and interior designer, one of the home features several unique functional and trendy rooms built in the Western Contemporary style. The home features&nbsp;glass railings, fireplaces, and large ceiling high windows that look out on to the nearby pond. In the bottom floor, there’s a home-theatre featuring a 12-foot sectional from La-Z-Boy, a workout room and a bar. On the main floor, there is a guest room,&nbsp;dining area, and an open-concept kitchen. Upstairs, there is&nbsp;three bedrooms including a master bedroom and&nbsp;&nbsp;ensuite with a unique&nbsp;glass wall. There’s also a laundry room upstairs which is&nbsp;always a great feature to&nbsp;blend comfort with lifestyle&nbsp;in an home. 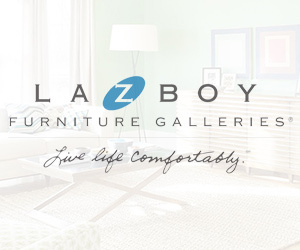 Lifestyle Meets Comfort offers free in-home consultations as a part of La-Z-Boy’s&nbsp;interior design services. Our expert designers&nbsp;can transform your home into the&nbsp;functional living space that is trendy, stylish and cool for you. Book your free in-home consultation and see what they can offer you too! Do you have BC's ugliest chair? It might win you a brand new La-Z-Boy! Is your Dad awesome? Win him a recliner for Father's Day!